On the Chip and PIN machines at work we have recently had this function kick in where, before you put in your card, it asks the customer a question. This is there for the entire transaction, whether you're paying by card or not. I think it's a genius idea, just an extra second to find out the opinions of the customer on important (and not-so-important/quite random sounding) issues to do with the company. However, this change to the whole routine is apparently just too much for the average customer! Is it really so difficult to get your head around the idea of this? After seeing the faces contorted with sheer confusion for a month or so now, the answer is simple. "Yes". They wonder if it's a real question. They wonder if this means they can't insert their card. They try to press the number buttons to answer. They get scared they've done something wrong. 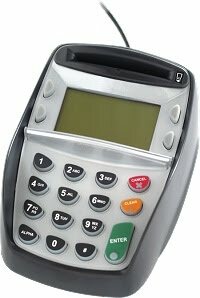 Please, if you see these chip and PIN machines in your travels, just click the grey button. It makes us happy!